Well this is a bit embarrassing. Last time I put a proper tutorial up on this blog, it was Halloween season. And now it’s the Christmas season, with a big huge lapse of DIY silence in between. I’m afraid that with my day job, commission work and additional Desert Bus for Hope responsibilities this year, something had to give, and that turned out to be the blog. On the bright side, Desert Bus raised over $500,000 this year, so that’s a whole lot of toys and games that’ll be going to improve the lives of sick kids and their families. I do hope though that this will be the first, last and only such lengthy blog lapse – I’ve actually already started saving up posts for next Halloween and Christmas season, in the hopes of having things ready to post when the fall of 2014 attacks my schedule. In the meantime, my profuse apologies, and let’s get on with Christmas prep. Because oh holy night, Batman, it is coming up fast! 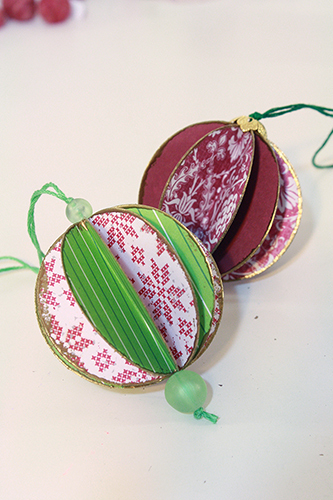 If your tree is a little sparse, or if you’re looking for a small simply gift idea, and especially if (like me) you still have previous years’ Christmas scrapbook paper (or old Christmas cards) hanging around, you might want to try your hand at these elegant little paper ornaments. 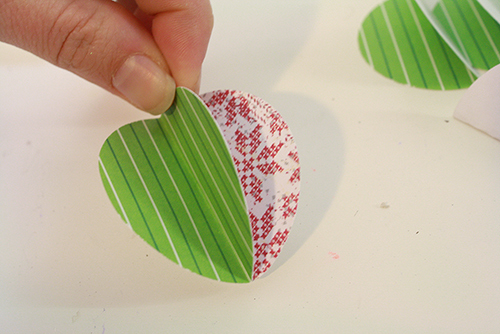 The first part of this tutorial is the exact same process as making the beach ball paper beads I posted years ago, only bigger. 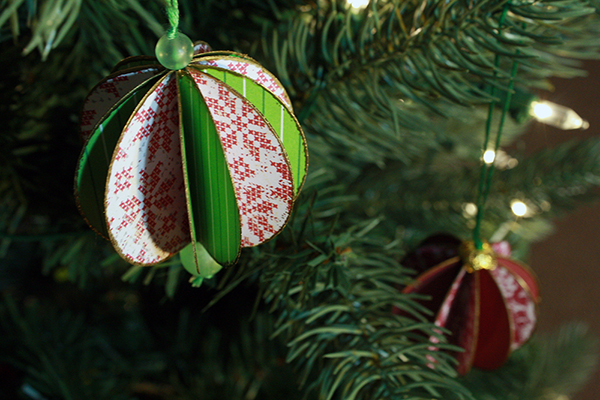 And then you add ornament-y bits and cord and put it on a tree and voila – you’re a DIY genius. tongs – like the kind you use in the kitchen – whatever you have will do. Even a pair of really large tweezers might work. They just need to be something that can get hot. 1) Start by cutting out a bunch of circles. You can do this with as few as 6 circles per ornament, but I think it looks nicest with 10-12. It’s really up to you. 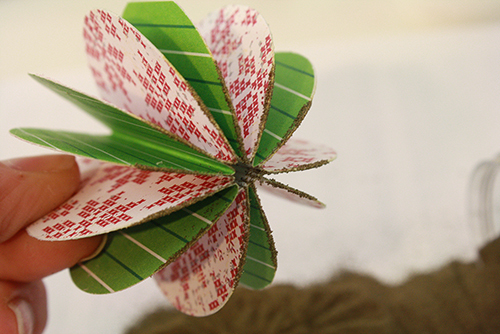 The more circles you use, the more of an overall round spherical look the finished ornament will have, but the less clearly each individual circle of paper will be visible. 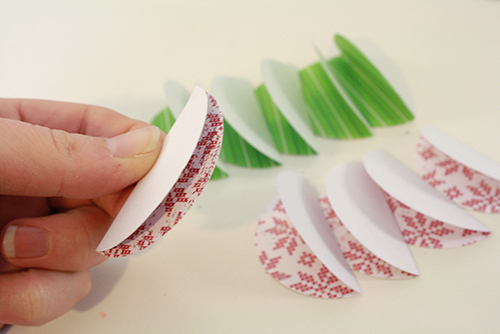 If you’re using two different papers (as I have for my ornaments and this tutorial) then cut out half your circles from one paper and half from the other. 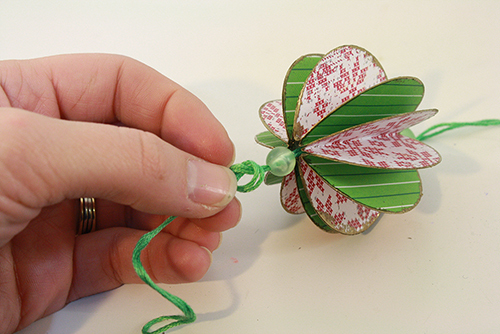 See my notes in the materials list about paper types – you should be using card stock weight paper, other wise you’ll have bending and buckling issues and your ornament will look sort of uneven and floppy in the end. 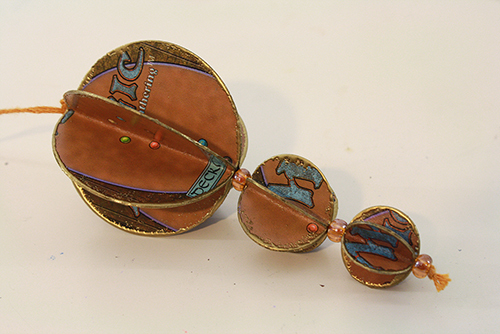 Also, velum paper is right out – it doesn’t do well with the heat (or the glue, for that matter). Trust me, I tried these things. 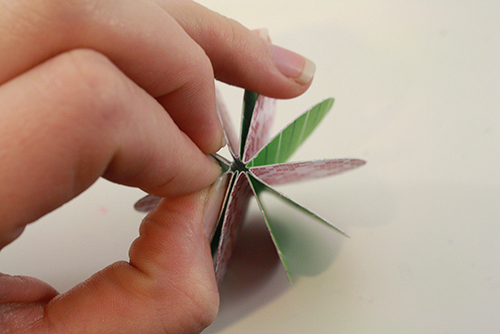 2) Fold each circle exactly in half, with the pattern facing inwards. 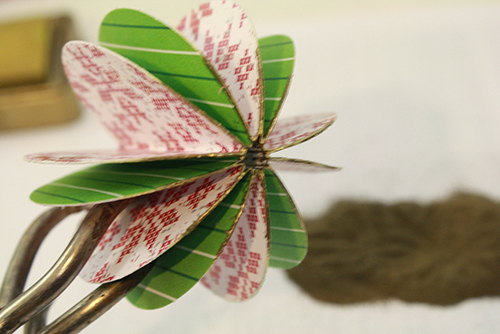 4) Now match up half of another folded circle piece with the glued section, making sure their folded edges and their outer, curved edges match as perfectly as possible. Press together along the edges to be sure everything is going to hold together. 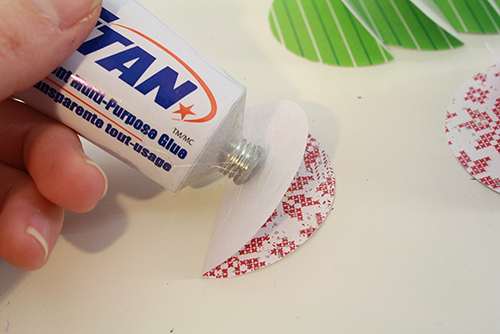 5) Apply glue to one of the sides of this new segment, then attach another folded circle of the alternating colour/design to it. 6) Now just continue doing this until you’ve used up all your segments. If any of your papers have a directional design (one that has a right way up, for instance something with words or letters on it), be sure you’re consistently facing that paper the same way up all around the ornament. 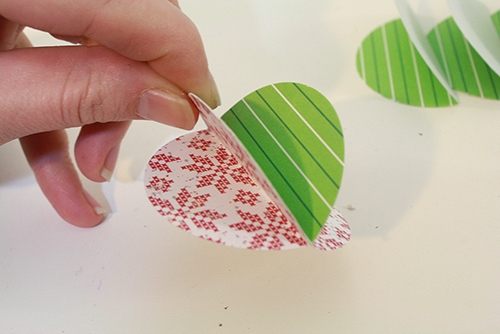 You may need to pause to let the glue dry a bit at some points before you continue on with adding more folded circles. 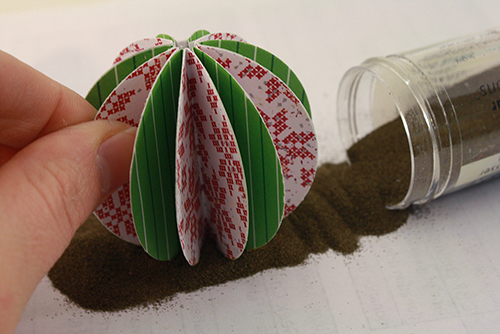 7) Once you’ve used all your folded circles, let everything dry. 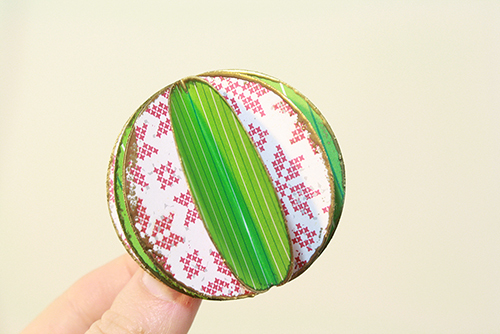 Then apply glue to the last two circle halves that remain unconnected, and hold in place with your fingers or with binder clips until the glue is dry enough to keep those final segments stuck together. Using your fingers to press all the segments in towards the middle at this point will help those last two segments hold together, and give the ornament a nice even shape. 8) Now let the glue dry thoroughly. Once it has done so, you can start the embossing. If you’re using an electric stove, go ahead and turn one of the burners on high. (If you’re using a gas stove or a heat gun you can just turn those on and back off as you actually need them.) Obviously make sure that nothing is on the stove, make sure anyone else in the house knows that you’ve got the burner on and it’s for a reason, and that no kids can accidentally stick their hand on it. And remember that you’ve turned it on so that you turn it back off again when you’re done. 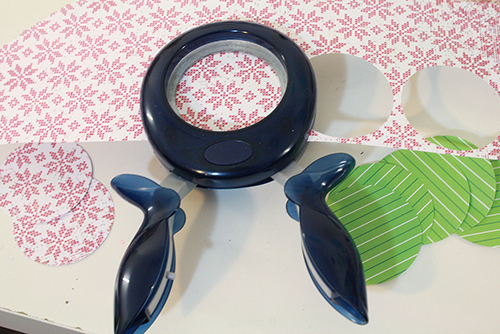 If your stove is far away from your crafting area, you probably want to take your ornament, tongs, embossing pad and powder into the kitchen and just do this next bit on the counter right beside the stove. If you’re already familiar with embossing then skip ahead to step 9. If not, here’s some basic information about it (and how it’s actually really simple to do). Embossing is a quick, simple and inexpensive way of adding some super classy-looking detail to various paper goods. And it’s dead easy to do. You need an embossing stamp pad (it’s just an stamp pad with ink that’s a bit more sticky and slow-drying than the usual stuff) and jar of embossing powder. 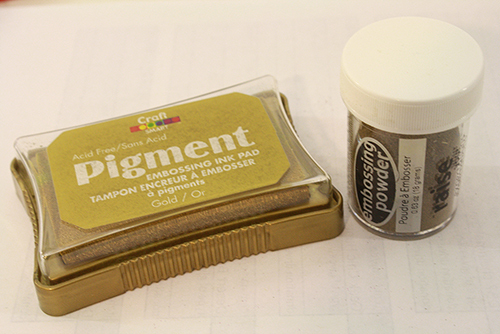 Ink pads are about $5 at our local craft store and embossing powder is about $6 a jar (and a jar will last you through a lot of embossing projects – probably upwards of a hundred). Pro tip: you do not have to have an ink pad that matches the colour of your embossing powder. The powder is the colour that will show up in the end. I recommend choosing a powder colour you think you’ll want to use a lot. 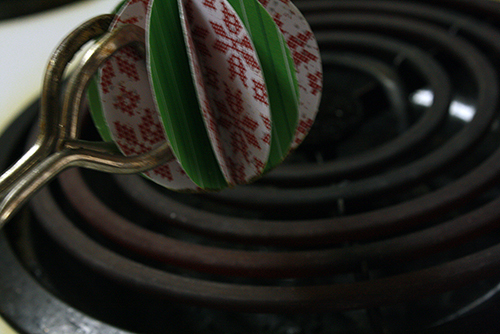 And obviously you don’t need to have a special heat gun either – your household stove will work just fine. In fact that’s the only way I’ve ever done my embossing. 9) So, start by laying down your sheet of scrap paper and dumping a small pile of embossing powder down on it. 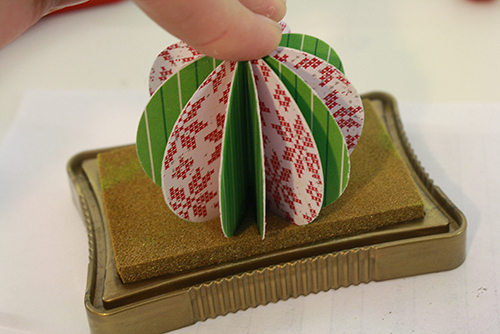 Now take your ornament and press one end of it into the ink pad. 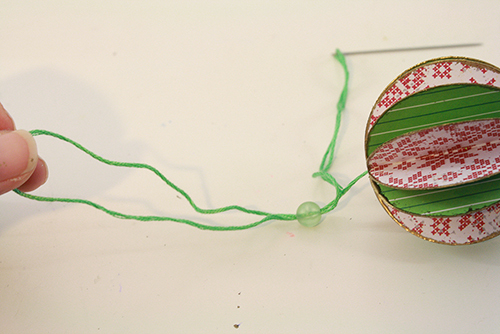 Roll it around a bit to get the edges of the ornament inked up as much as you can at that end. 10) Now dip all that inked up area into the pile of embossing powder. The powder will stick to the ink. 11) Take your ornament to the stove (or use a heat gun) and use the tongs to hold the ornament over the heat, with the powdered side closest to the stove. 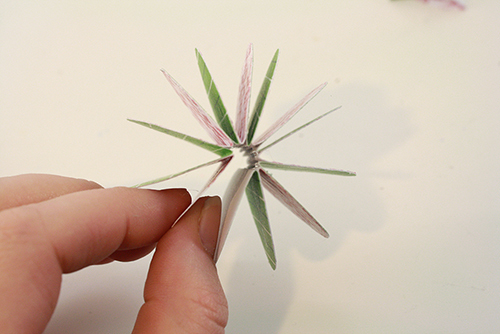 Hold it a good inch or two above the stovetop – you don’t want to scorch the actual paper. Then just wait for the embossing powder to heat up and melt into a nice shiny coating. Over a stove on high heat this usually only takes 10-20 seconds. 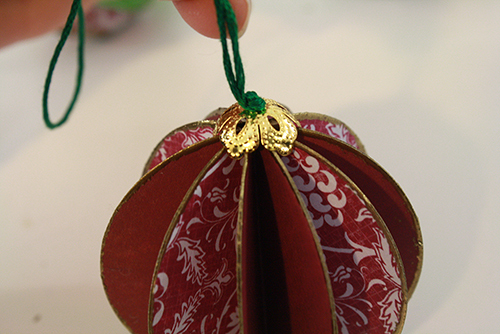 12) Now do the same thing with the other end of the ornament. If either of the ends didn’t get quite as coated as you wanted them to, just rub them on the ink pad and dip them in the powder again and re-emboss overtop of the first coat. Note: give the embossed areas 10-20 seconds to harden before touching them, or they’ll still be a bit sticky and can get smudged. If this does happen though, just re-apply ink and powder and emboss back over them again. 13) You should now have an ornament with shiny embossed bits on the edges at the top and bottom, and un-embossed edges in the middle. 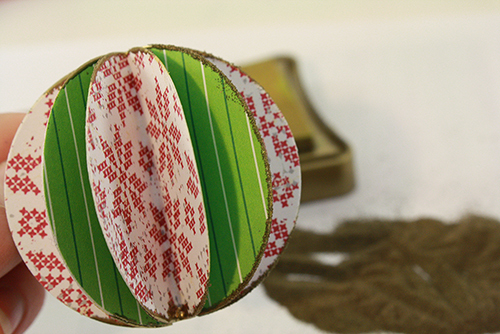 Take the ornament and rub one of the un-embossed edges in the ink, then dip it in the powder, then heat it. You can probably do the edges of 2 to 3 segments at a time to save yourself a bit of back and forth. Continue until all the segments’ edges are totally embossed. 14) Turn your stove or heat gun OFF. 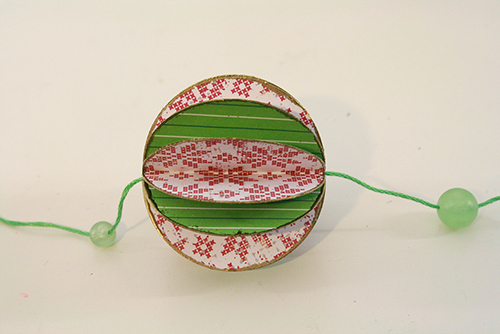 15) Now to string your ornament. Cut a length of embroidery floss/string/etc. about 15″ long, and thread it onto a large needle. 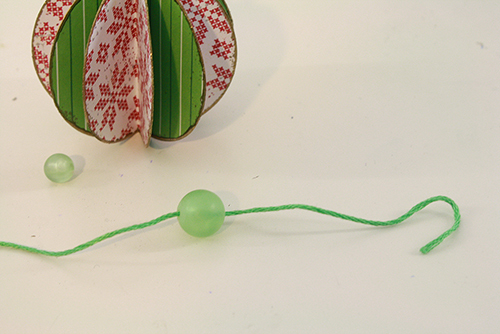 Lay out any beads that you might want to add above or below the ornament. 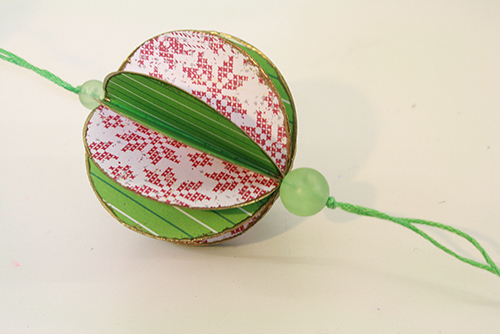 17) Now thread the needle through the ornament itself, and then (if applicable) through the bead you want to have resting on top of the ornament. 18) Thread the needle back through the top bead, but leave a loop of thread 4-5 inches long – don’t pull the thread all the way through. 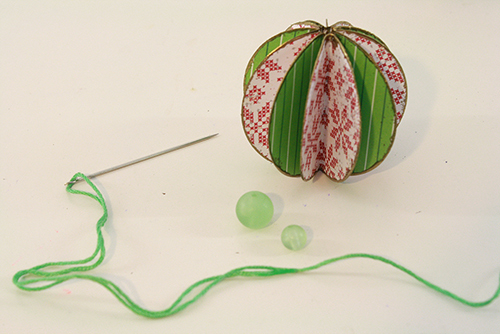 Continue by threading the needle back through the ornament and the bottom bead, still leaving that loop at the top. 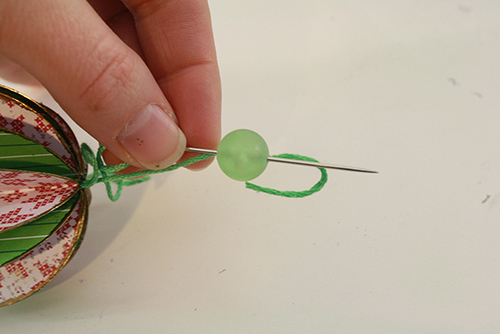 19) Now make a knot in the thread just above the top bead. If the knot is small enough that it can be pulled through the bead’s hole, make another knot or two on top of it. 20) From the bottom of the ornament, push everything up until it’s pushing against that top knot, then tie a knot (double or triple if needed) directly underneath the bottom bead, to hold everything in place. Trim the ends of the thread. 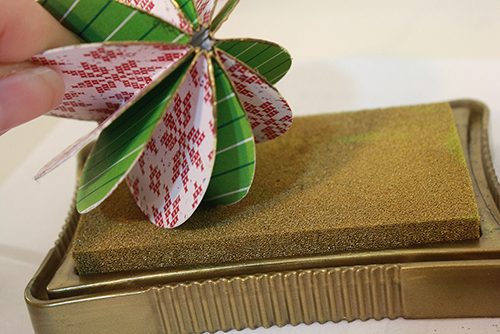 21) And voila, you have made an elegant embossed paper ornament! 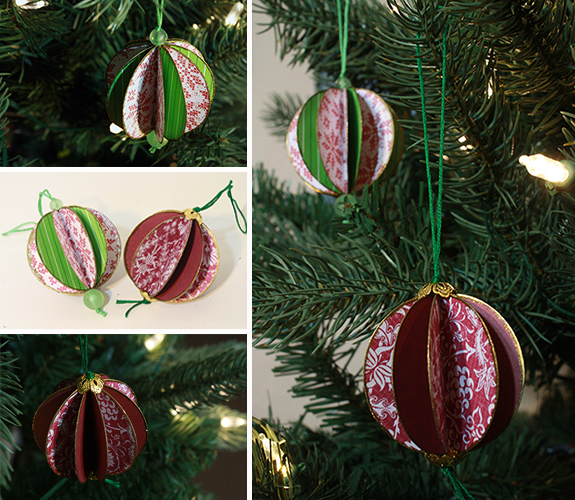 Hang them on your tree or in windows, give them as gifts. 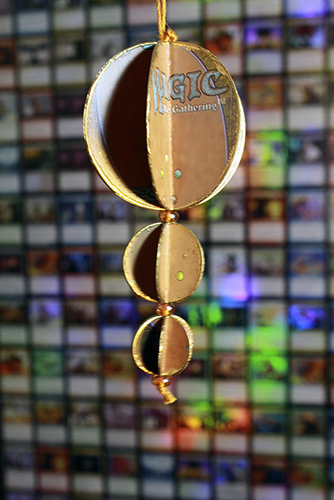 And perhaps, as with my other paper ornaments tutorial, you might want to try this with Magic cards, or some cool-looking playing cards. 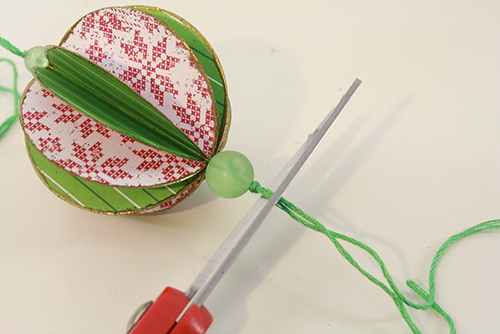 Or try stringing multiple paper balls of varying sizes together. purchasing tips to help without breaking the budget make your thoughts possible. players an opportunity connect to their friends and to get involved in many games. This is not only impossible if you have the correct requirements. They are usually provided on the web and you also could get them throughout your e-mail address. by you in your console. it seems because locating the electrician that is greatest takes some effort and time. demands of the occupation that is electrical that you want done. electrical plans in both industrial and domestic level. coupons in the appropriate arrangement. Consider buying several baseball card slots and putting them in a publication. This will help when needed you clearly see your Ralph Lauren voucher code 2015 Lauren coupon code 2015 and enable you to catch and go. You need to make an email based newsletter to your web design company to increase your client retention charges. more loyal towards the brand, and can make customers feel connected to your own organization. any difference to search for the bag from others. are plenty of cool laptop bags nz that can be found in the market. Numerous materials are used in manufacturing these bags like cloth, linen, leather etc. You can pick the correct Cool laptop bags nz for your-self and get found. Your trendy messenger bag may be unique just like you. make sure to do your homework before jumping in. Given the abundance of scams and ventures that are disreputable out there, it’s not that difficult to be taken for serious cash. the valid chances from the awful ones. private, and hire academies around that making a selection that is sound might be tough. it is critical to do some re-search. Request your friends and family members. at your Finish Line free shipping code 2015 Line discount code 2015. Be sure you’re studying the fine print. Be sure to understand the jargon that’s used onto it. Ultrasound scans are utilized widely throughout pregnancy. syndrome and also the position of the placenta when the child is due. attaches outside the womb to a oviduct, ovary. Breech births can be also detected by them where the child is upside down. In this case caesarean section would be needed by the mother. that features a package of pictures, DVDs CDROM or USB drive. trailers nz which are widely well-known in the industry. of those two nz trailers layouts bunk models are thought superior for aluminum frame that was riveted as well as for their slim hulls. But many of the motorboats can simply help both the nz trailers layouts. selections you make. How long have they been in business for? What is their standing like? Are their costs reasonable or too large? bargains you want. This short article is certainly going to help you with that. by you so you could understand what to do. office chairs furniture auckland you need. you’re planning to read, and make sure attention is paid by you so that you could know what things to do. have your own personal paginas web en puebla site marketing a service or product. Do you understand change one or the best way to develop a page? may well not have the budget to outsource. referred to as the cloud, cloud computing provider and etc. most don’t even understand precisely what it means. So what exactly is cloud-computing? is browsed by you at the other end-of the link. Just how can you speed web link up? site that is cross-browser compatible and W3C validated. Web-developers design templates in layers which are stored in PSD formats. The iPhone 4 is an exceptional multi-touch display smartphone developed by Apple. that is visible, internet browsing, Wi-Fi connectivity, etc. periodicals, films, games and applications. 4 in your fingers. It is actually a stunner and how can i transfer photos from iphone to pc. great time, but sometimes games can come with risks that are concealed. Some games offer content that is inappropriate for his or her ages. as well as the following article will demonstrate how to do just that. to work as you can. information concerning my presentation topic, which i am going to convey in university.